Love the diagram Gordon. It’s refreshing to have a diagram where the import is not camouflaged by arrows going which-ways and upside down text. I tracked down your blog through a comment you left on Ken Anderson’s. When Alan Levine was discussing Twitter, he recommended selecting those one follows very carefully as being the secret to having a productive Twitter experience. I believe he compared ‘mass following’ with ‘lying down with dogs, thereby catching fleas.’ I believe it’s the same with blogs. I’ve followed Ken’s musings since I first encountered him on PLENK and grew to love him for his unbridled enthusiam for learning and oft times mischievous intellect. I agree with him that a provocateur is a vital component of a network. Learners can never afford the luxury of complacency. But I believe it’s vital that the provocateur is informed, as Ken is. I’m glad that the emerging knowledge appears to be emanating from a sanitary source. Only thing I was confused about was the impact of the USB sockets. Can you elaborate for me ? What a great creative exercise if every MOOCER created their own. If you don’t mind I’d like to have a go some time down the track when I’ve had ages and ages to process. Yes – I agree about provocateurs. They fulfill a useful function provided they stay as fresh as Ken (one of SixChick’s ‘failures’!) and don’t get stuck in a groove like some informed cranks who ‘flame’ in some forums (not CCK11). Of course it was always so in the real world but social networking makes it that much easier to pick and choose! I’m just as puzzled about where SixChick came from – the 1960s is the obvious answer so maybe she’s a blast from my past! It’s occurred to me that a MOOC bears many similarities to the actual (as opposed to the intended!) learning experience of a typical 20th century university or college student away from home responsibilities for the first time: meet strangers – argue all night long on deep issues you forget the next day – skip lectures or go to them unprepared and then talk through them incessantly with your friends – make fun of the profs – experiment, collaborate, copy stuff from other people – make lots of mistakes! All an important part of the learning process and very enjoyable but usually curtailed when reality set in – in the shape of exams etc. Maybe all this is more the essence of a MOOC than the word ‘course’ suggests – or maybe I’m havering! Oh – USB sockets? For the non-human appliances to connect! I loved reading this! I appreciate it when humour is used in learning, sure helps me, anyway! Yes, MOOCs are quite the phenomenon, I keep coming back for more! love the image and the dialogue! We had a definitive “PLENK duck” in our last course. This time around, I think this is the defining image of the course :). Thanks George! My own suggestion is to adopt ‘Massive Open Online Learning Event’ as a generic term so ‘Mooc’, pronounced as a single word (to de-emphasize the ‘course’ connotation), then becomes the special case for Connectivism. This is an awesome image, kind of an infographic and a work of iconic art all-in-one. Mine was, that it is a method I used ever since, so too mixed to pin it. ps: George, i am really sorry that I seem to tease you on twitter – it means no harm ! I love the tweet and retweet placements. Love it! So fun! Thanks for posting it and for the interesting dialogue. I found myself going back and forth while I was reading, agreeing with them/you both. The Connectivist Cowboy rides Across the network instead of Along fence lines formed by conventional connections. When they aren’t herding large packets of nodes into coherent theories they are either playing poker with games theorists or in shoot outs with rouge nodes who gang up into bad ideas. They also participate in contests similar to rodeos, riding incomplete ideas and feral speculations. Not so much to break them in for domestic use as for the fun of being tossed around by a worthy opponent. Thanks Leah – I like Scott’s Connectivist Cowboy too – for me anyway this sort of metaphor resonates rather more strongly than the philosophical slant – eat your heart out Wittgenstein! Lucky he’s not here hey ! Would you be willing to allow me to use it alongside a definition of Mooc in the thesis I am writing on change and the use of emergent technologies? This a not for profit endeavour, as it is part of my studies, and would include attribution both to yourself and to Jose Bogado. Yes of course Ailsa – I’m flattered! I’d also be pleased to see your thesis if you publish it at some stage. Yes Lorena, please feel free to use the image and best of luck with your dissertation! I’m old enough to not worry about sensibilities Gordon. I would hope the people with whom I interact have evolved far enough to deal with a little tongue in cheek. Yes, too late I realised because it’s a page as opposed to a post it doesn’t allow for comments. Backchannel chat seems to have died in the …… anyway so I feel it’s location was apt. Thanks for taking the time to comment on my version of your wonderful creative ‘infographic’. 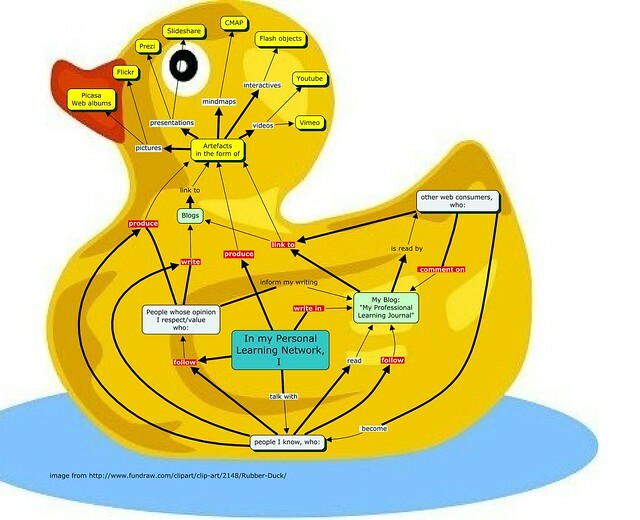 Love the duck! Of course, I love me some duck on a chalupa. Or maybe in duck soup. Duck stir-fried with vegetables. I’m getting hungry. I hope there’s more than grasshoppers in the fridge. Would you consider putting your dialog into Xtranormal – or allowing someone to do it? It seems Xtraordinarily suited to that medium. Thanks for your interesting suggestion Jim. I just haven’t the time to consider doing anything much now but have no objection at all to anyone else having a go. I experimented with Xtranormal for something else – see my first post in this blog. ‘Hello world! What’s new under the sun?’. That was originally done for iBerry (The Academic Porthole) but it didn’t seem to draw much interest and in view of the time I spent doing it, I never really contemplated doing another. You spent a lot of time tweaking gestures – and set the bar rather high for me. Not sure I’ll be able to equal it but I’m giving it a shot. 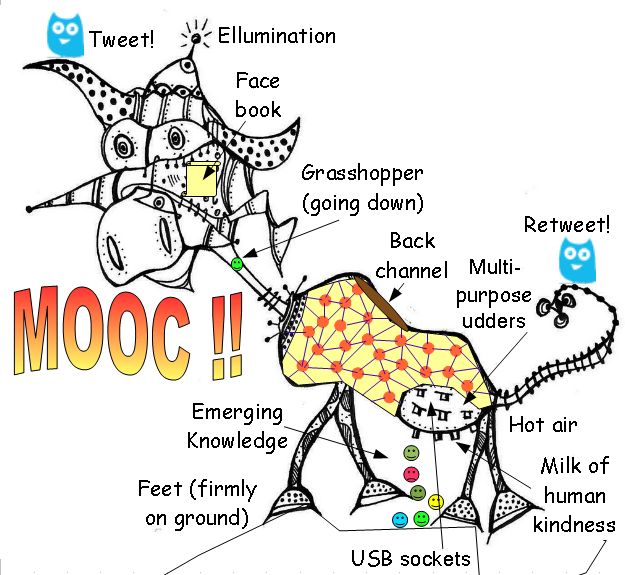 I wonder if any xtranormal users can help me find a spelling that gets “MOOC” pronounced correctly instead of rhyming it with “book”? I’m using mooque – not completely satisfactory, but best I’ve found so far. Thanks again! Yes, can be a pain matching the rather limited gestures to the text and sometimes it’s easier to fit the text to a particular gesture rather than vice versa. Articulation using text-to-speech systems is still far from perfect but I think I managed to improve it for some words by splitting them (or was it hyphenation?) so might be worth trying something like moo-ki , moo ki , moo que etc etc – and you may be lucky! Will post it on my blog with a link crediting Gordon as soon as I have time. Also plan to export it to Youtube. Very cool! Everyone liked Gordon’s original post, and it’s a lot of fun to see the characters enacted. Thanks for taking time to do this–it works! Interesting image! Great discussion! Thanks to the link to Gordon’s video! Serious play over time contributes to our collective understanding of informal learning in networks.